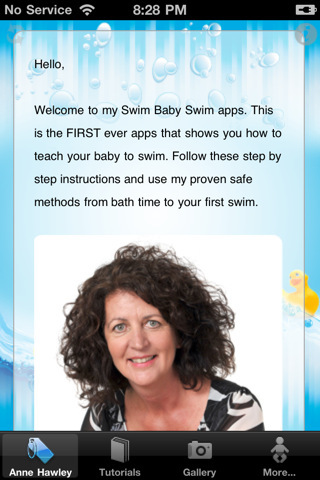 When we were invited to trial Swim Baby Swim swimming lessons we were also given the chance to try the new swimming app that Anne Hawley has devised. 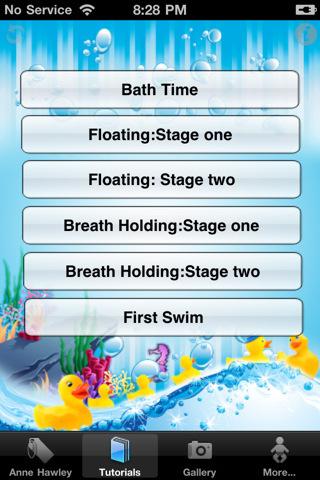 We are trialing the toddler swimming app and we're using it alongside the lessons that Isla is taking. The app has 6 detailed tutorials, that guide you step by step from bath time to babies first swim. There are lots of hints and tips and some lovely images of babies swimming and children having fun in the water. The 6 tutorials cover bath time, breath holding, holding on and letting go of the pool edge, rotating in/ under the water, jumping in and finally the first swim. The bath is the first focus of the app as of course this is the place that babies really experience water on a regular basis. Hair washing is a great time to get baby used to the water and having water over their faces. Isla loves the water and so naturally loves bath time, she has to be really grumpy to not want to get in the bath. She has never complied when we've asked her to tip her head back when we've washed her hair but this turns to out to have worked in our favour now as it means that she is so used to having the water flooding down her face and it doesn't faze her. Since we have been having the lessons and started using the app she has also taken to trying to chuck a beaker of water over her own head, so her confidence is already increasing after only a couple of weeks! Anne discourages the use of buoyancy aids in the pool and so there is another section on these and if you're already using them tips on how to get rid of them from your pool routine. As we've never used them, this isn't a problem for us, but most parents use them at some point or other so this is a very interesting topic. Breath holding is at the very centre of Anne's teaching and so the 2nd tutorial explains how important this is and the techniques that can be used to get kids to do it. Includes showing your toddler how to blow bubbles in the water, that they should keep their eyes open under the water and getting them to imitate you putting your face in the water. So far Isla has had fun watching us blow bubbles in the water and has tried to imitate. We still have to try pop ups whereby you put your face in the water and then encourage your little one to do the same. We're still working our way through the app and we're using it to supplement the lessons that Isla is still taking with Swim Baby Swim. She's at an age whereby she will sometimes do what we ask but mostly will try to do what she wants to do, so when we're in the pool and we're teaching her to hold on to the side or letting her work out how to climb out of the pool on her own it can result in her doing her own thing like climbing out and trying to run off! I think as she gets older and her understanding improves we'll be able to be a lot more disciplined when using this app. All in all I think that this app helps to give parents confidence around their little ones in the pool and gives the little one a confidence in their own ability - especially if mummy and daddy are ready with a big round of applause for every achievement! 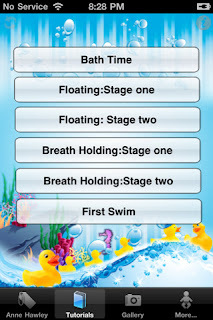 The Swim Baby Swim iPhone app costs £2.99 and can be downloaded from iTunes. In order to trial this iPhone app we were given it to download of free of charge.